Colorful tapestries hang over the main buffet room, which is patterned after a Harambe marketplace. There are four separate dining areas, three of which are connected and very open, while the third is somewhat detached and has a lighter sandstone theming. Tusker House is one of the more spacious character breakfasts, with ample room for the safari clad characters to move around in. There are quite a few American standards here for breakfast such as Scrambled Eggs, Mickey waffles, and danishes... along with many African influenced dishes including Beef Bobtie Quiche, Spiced Corned Beef Hash, and Mealie Pap. 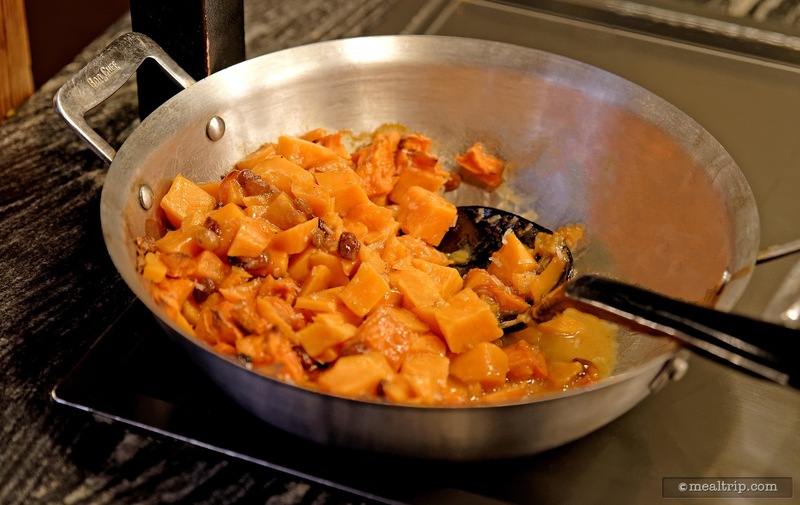 There are also great, unexpected selections that seem to fall somewhere in between the two, including Carved Rotisserie Honey-glazed Ham, Yam Casserole, Cheese Blintzes, and a couple of Frittata selections. 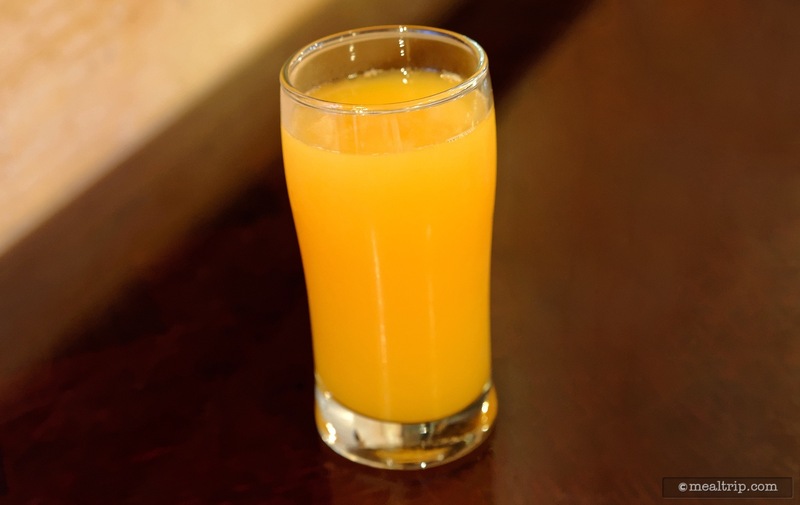 Non-alcoholic beverages are included, with the popular Jungle Juice being a customer favorite. Tusker House, at Disney's Animal Kingdom is now a buffet-style character meal for all three dining periods, breakfast, lunch and dinner. In the not so distant past, it had been a character meal for breakfast only. It seems to me, that a few positive tweaks have been made to the previously named "Donald's Safari Breakfast" since my last early morning visit. The most noticeable, is that Disney has pretty much done away with the whole notion of giving out physical photo prints to guests while they are at character breakfasts. It had been the case, where you would wait outside Tusker House, for quite a few minutes in separate sub-line, while your group's photo was taken with Safari Donald. I likened the experience to having a dreaded physical education class first period… you just don't want to spend that much time in the still, muggy, Florida heat, that early in the morning. It was however, an important photo, because Donald, did not roam around inside at his own breakfast, and this had been your only chance to meet him. Later in the meal, a cast member would come around and deliver a paper framed print of that moment. I do have a nicely framed photo of my family from a visit many years ago, and it is a great souvenir. 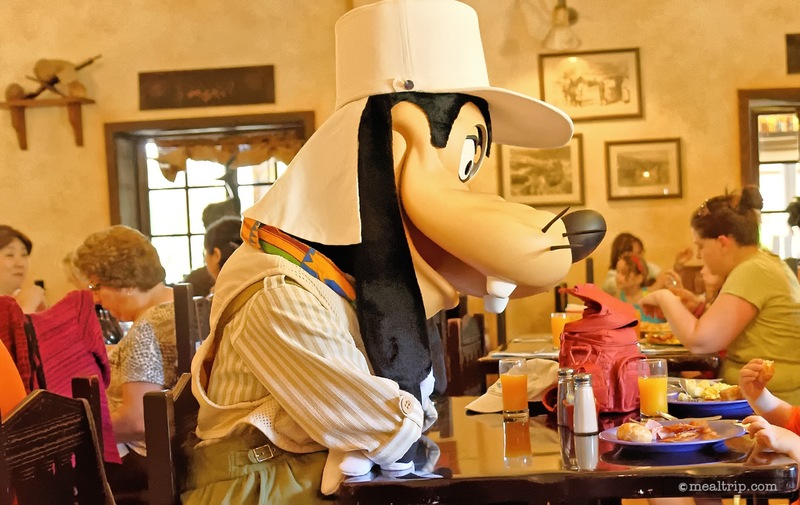 However, I also remember having discussions about going back to Tusker House for breakfast only to be met with "yeah, but that wait outside… isn't there someplace else". Some might see not getting to pose for that hard-copy photo as a loss, but really, the Photopass system is quite good and now it seems that freeing Donald up from those duties, allows him to meet and greet with guests inside along with his pals. It also seems to speed up your entry into the restaurant quite a bit as well. I simply walked around the corner to the front door after checking in, and my name was called to be seated! The fab-four (Mickey, Goofy, Donald and Daisy) in Safari clad make their way around the dining room, interacting with guests, and occasionally try getting a line-dance going with the little ones, complete with ethnic noise making, rattle-type instruments and a special musical track. The characters have ample room in most of the dining areas and seem quite relaxed and willing to spend time autographing books and posing for photos. Photopass photographers were around if you wanted them, but they were in no way "pushy" or trying to get your photo. They would hang back, and let the characters interact with the guests, and only jump in if they saw a great looking special moment, or if asked to take a photo. 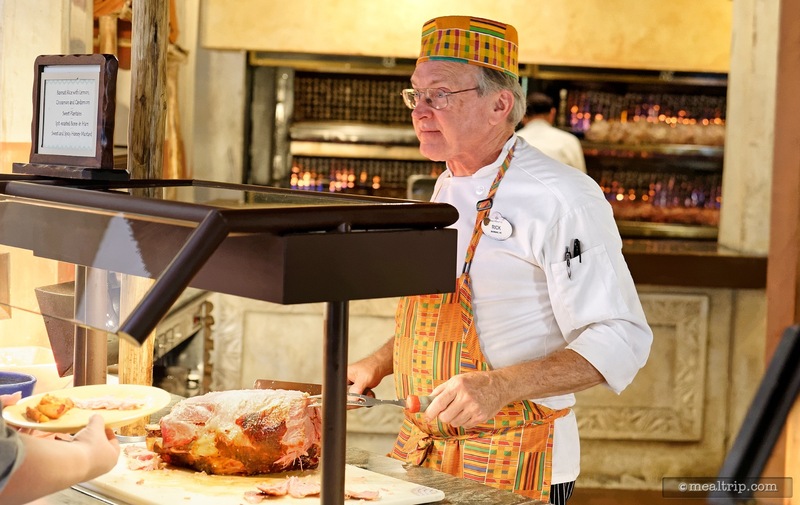 The breakfast staff at Tusker House is usually quite relaxed and friendly, but also hard-working (cleanup, is a big part of working in a buffet). They are attentive and remove empty plates quickly from the tables before they stack up. It is worth noting that while in the "real world", buffets are often seen as a "cheap way to eat a lot"… the character buffets at Disney are not inexpensive, and borderline on a premium experience. I have found, that this attracts some of the best, and most experienced wait-staff. At the character-based buffets, I would be hard-pressed to remember a "bad" service experience. Having been to the Tusker House on-and-off over the last ten years, it's also really neat when one of the waiters (from an entirely different area of the restaurant no less) remembers you from "last year's" visit, and stops to say hello to you. Very cool. Ah yes, the main attraction. 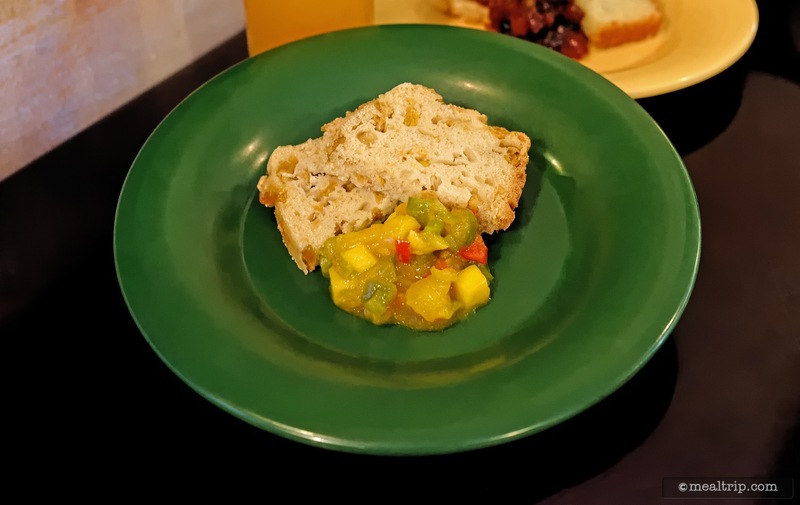 The buffet-style breakfast food at Tusker House is very much American or "westernized" with little spice notes to Africa and India tossed in here and there. 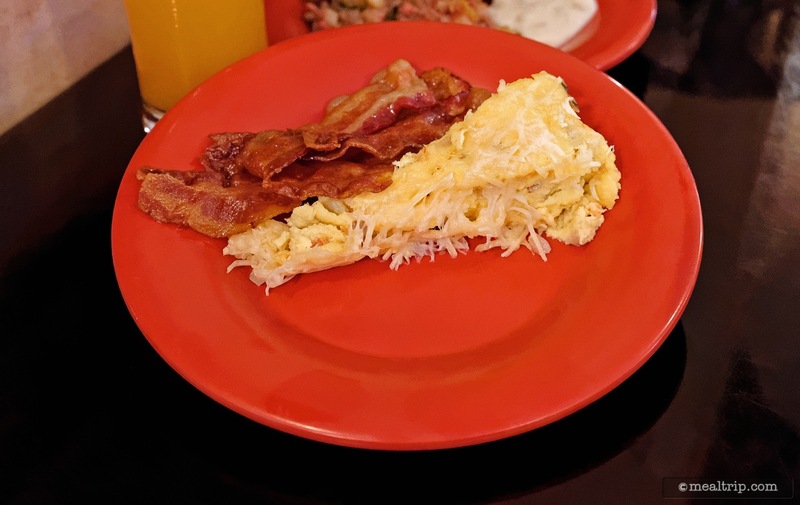 Those that are looking for standard breakfast items such as scrambled eggs, bacon, and even biscuits and gravy, will have no problem finding them here. 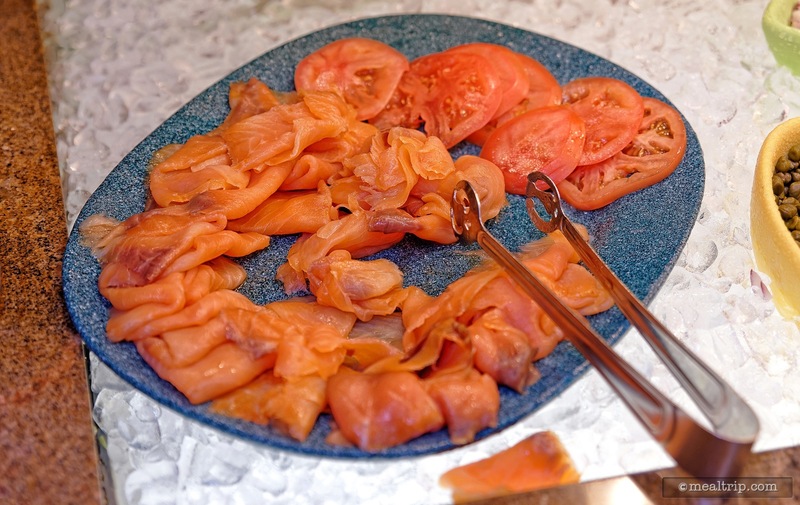 Cold smoked salmon, tomatoes, capers, onions, cream cheese and bagels are also available if you would rather go that route. 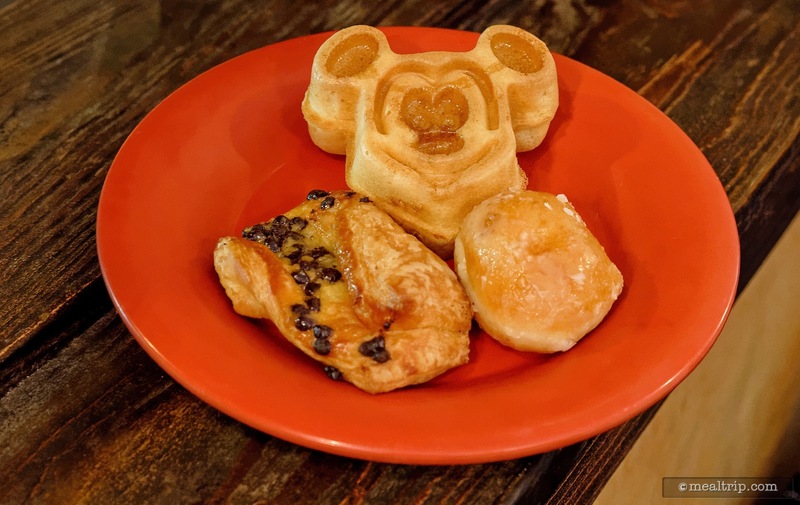 There are even mini Mickey waffles with maple syrup, yogurts, granola, cereals such as Frosted Flakes and Raisin Bran, and fresh fruits, so that everyone should be able to find something they like for breakfast. 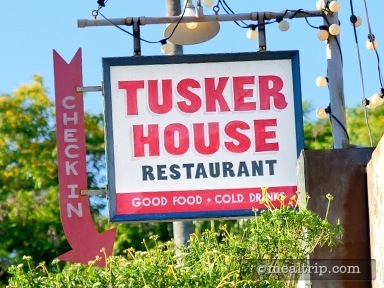 There are a few things that stand out as the reason you might visit Tusker House for breakfast though, and those are the dishes that are unique to this location, such as the Beef Bobotie (which is spiced beef with an egg-based topping), the Coconut Sweet Potato Casserole, Mealie Cornbread and Mango Pepper Chutney, Cheese Blintz with various toppings, or the Spiced Corn Beef Hash with Cornbread Topping. 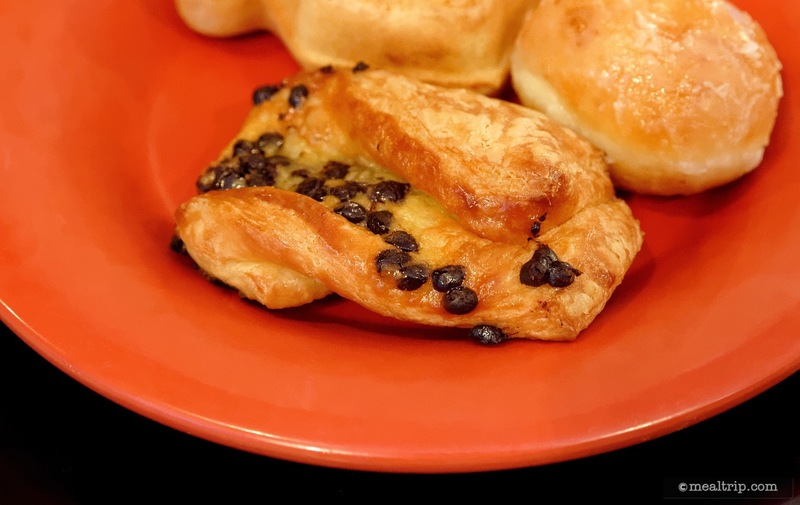 All, are very delicious, and worth a try... even if you're going the all-westernized breakfast route, here's a chance to try a little something different. Remember, you don't have to fill your plate up. Just try a small portion of something that looks interesting. Some of the other buffet locations that you will find at Disney will have a fresh, made-to-order omelet station… but not at Tusker House. There's a spit roasted ham being carved! The ham can be paired with such things as basmati rice with lemon, cinnamon, and cardamon, a spicy or sweet honey mustard sauce, roasted sweet plantains, and roasted red potatoes. 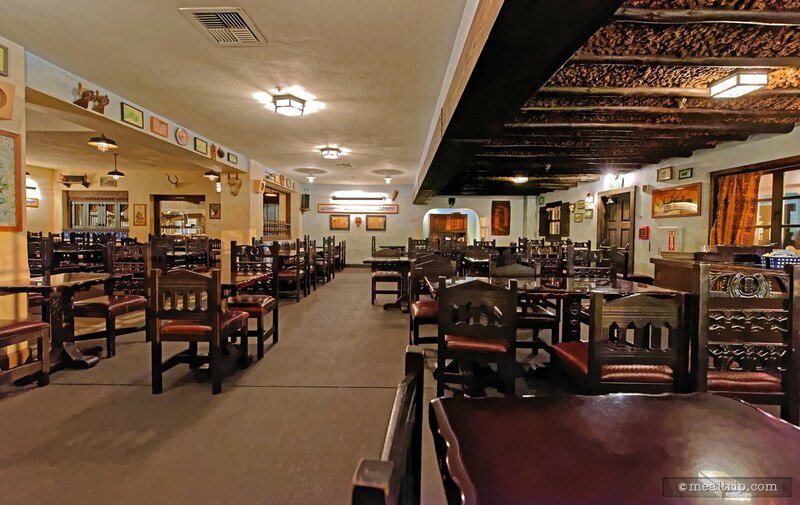 Look just behind the carving station, and you will see the restaurant's open flame, on stage, spit roasting station. Also very cool, there is now a station dedicated to Gluten and Allergy friendly items. Many of the breads and bagels are from Udi's and are gluten, dairy, soy, and nut free. 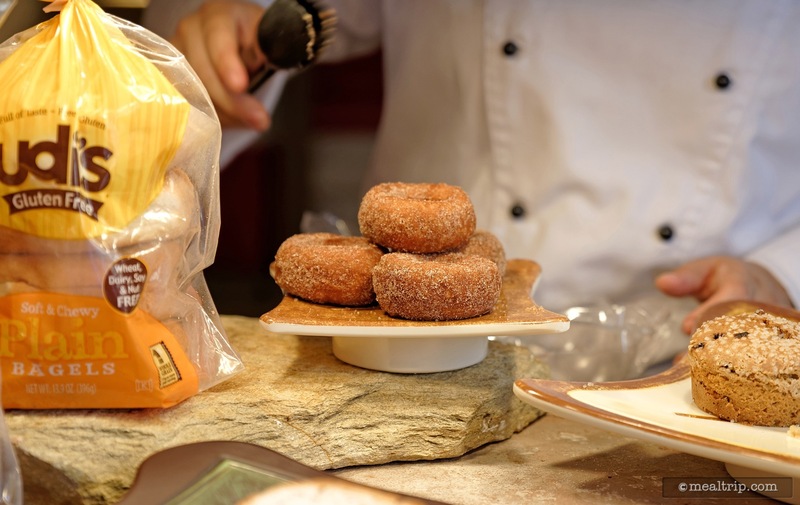 There are also some great looking Kinnikinnick's Cinnamon Sugar Donuts available. If there's any chance you have room left, there is a center dessert station that usually contains warm cinnamon rolls, baked banana cream cheese fresh toast, chocolate twists and even Krispy Kreme® Doughnut Holes. 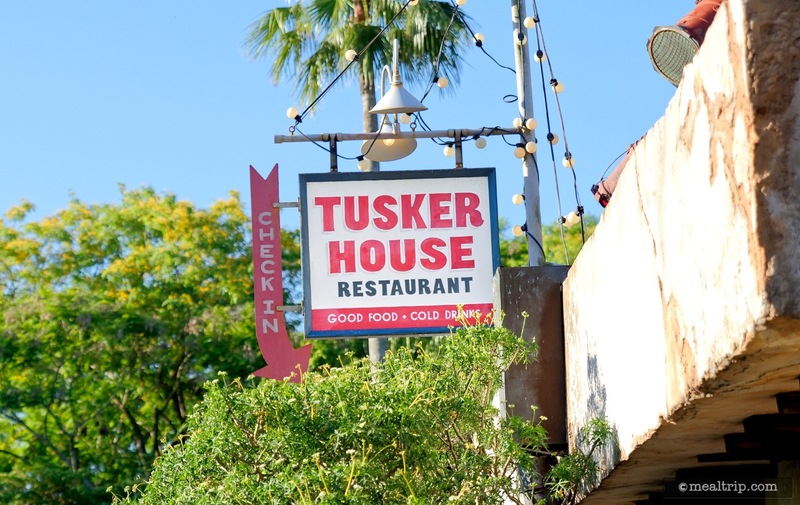 The whole menu can be found here, Tusker House Breakfast Menu. It may change a tiny bit from day to day, but most of the items here are long time guest favorites. Here's a food hint… don't forget to grab a whole Banana on your way out! They are all over the place near the buffet, and they're so good looking, most people think they're just for show! They're not though… you can totally have one of those gorgeous bananas to eat, or take with you for a snack later! Tusker House is usually a couple dollars less than the other in-park character breakfasts, so the value is there when comparing it to those. Still, it is a character breakfast, and so part of you tab is going for the added entertainment value. At a few of the other charter buffets on Disney property, I have had to close with a somewhat somber "well, you are not going for the food, you're going to see the characters" remark. But I'm glad to say that's not the case at Tusker House. 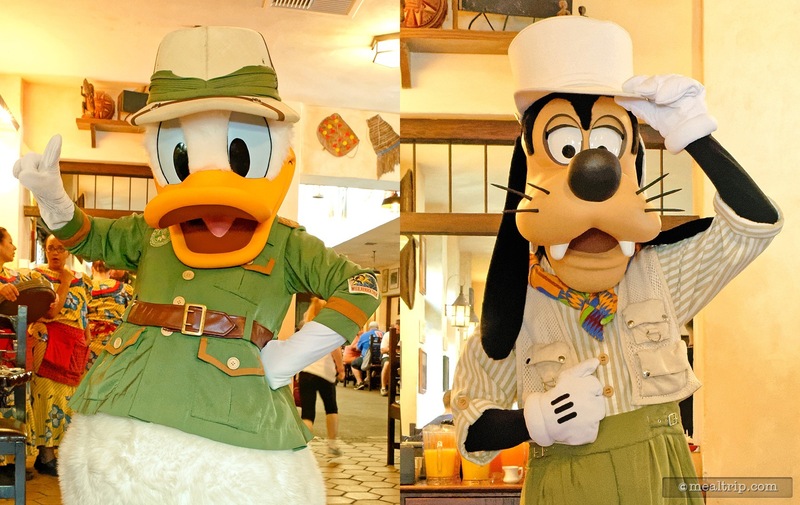 Sure, it's a great way to see some of your favorite classic Disney charters dressed in cool Safari outfits, but the food here… is actually strong enough to be the main attraction. 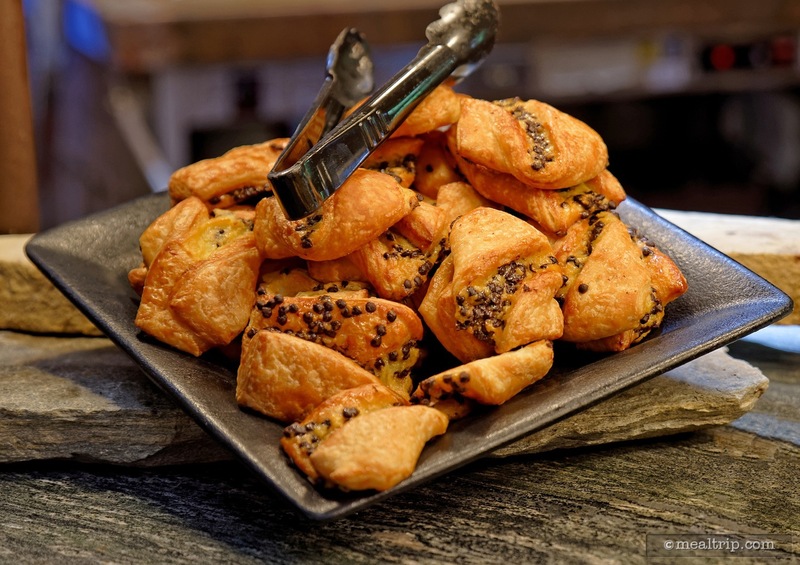 Even if you don't plan to sample some of the more unusual breakfast items, a very decent American-style breakfast can be put together here, and it still ends up being one of the better buffet values on property. 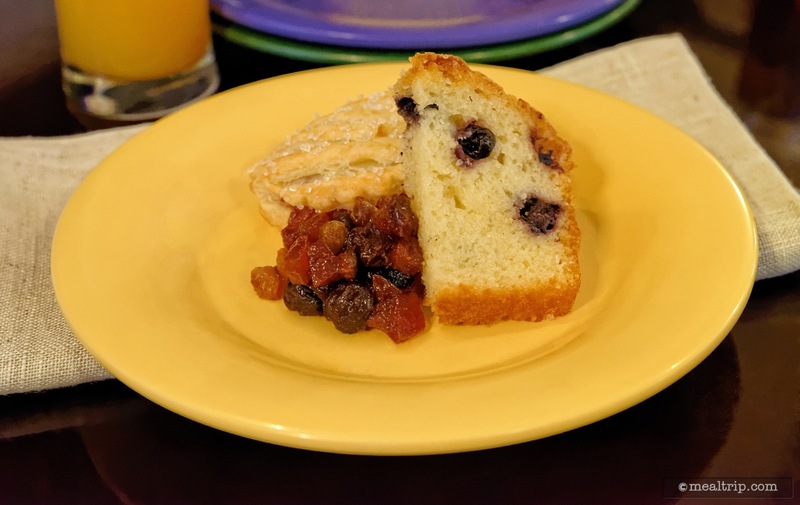 All in all, there's not much I would change about breakfast at Tusker House. Purely from a foodie's standpoint, I do wish more of the items had the spice notes and nods to African cuisine that the Lunch and Dinner periods have, but I also understand the need to have a more familiar type of breakfast times available for the masses. I would definitely recommend it for breakfast, even if you have no desire to meet and greet with the characters. CLICK HERE to view all 32 images in our photo gallery.